Doesn't this just say it all?
" life is too short for a bad cup of coffee!" Gosh... ain't that the truth! when I need that energy pick me up. And what goes better with a cup of coffee? A good book and quiet time with the Lord. 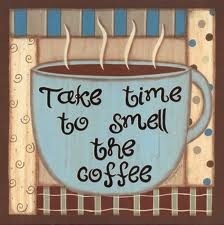 I hope you "Take time to smell the Coffee" today! Yes, life really is too short for a bad cup of coffee.. haha. How fun that you got a coffee grinder. I love mine. Amy, we've been praying for you, and that you will be feeling better quickly. I continue to remember you in prayer. You have made me long for a good cup of coffee. How wonderful fresh ground coffee smells! I love cold coffee with all this summer heat! I am so happy you ground your own fresh coffee beans!